عظیمی, رخساره, ریاحی بختیاری, علیرضا, مرتضوی, ثمر. (1394). هیدروکربن‌های آروماتیک چند حلقه‌ای در رسوبات سطحی سواحل جنوبی دریای خزر، شهرستان انزلی: ارزیابی سمیت و شناسایی منشأ. مجله آب و فاضلاب, 26(4), 41-50. رخساره عظیمی; علیرضا ریاحی بختیاری; ثمر مرتضوی. "هیدروکربن‌های آروماتیک چند حلقه‌ای در رسوبات سطحی سواحل جنوبی دریای خزر، شهرستان انزلی: ارزیابی سمیت و شناسایی منشأ". مجله آب و فاضلاب, 26, 4, 1394, 41-50. عظیمی, رخساره, ریاحی بختیاری, علیرضا, مرتضوی, ثمر. (1394). 'هیدروکربن‌های آروماتیک چند حلقه‌ای در رسوبات سطحی سواحل جنوبی دریای خزر، شهرستان انزلی: ارزیابی سمیت و شناسایی منشأ', مجله آب و فاضلاب, 26(4), pp. 41-50. عظیمی, رخساره, ریاحی بختیاری, علیرضا, مرتضوی, ثمر. هیدروکربن‌های آروماتیک چند حلقه‌ای در رسوبات سطحی سواحل جنوبی دریای خزر، شهرستان انزلی: ارزیابی سمیت و شناسایی منشأ. مجله آب و فاضلاب, 1394; 26(4): 41-50. 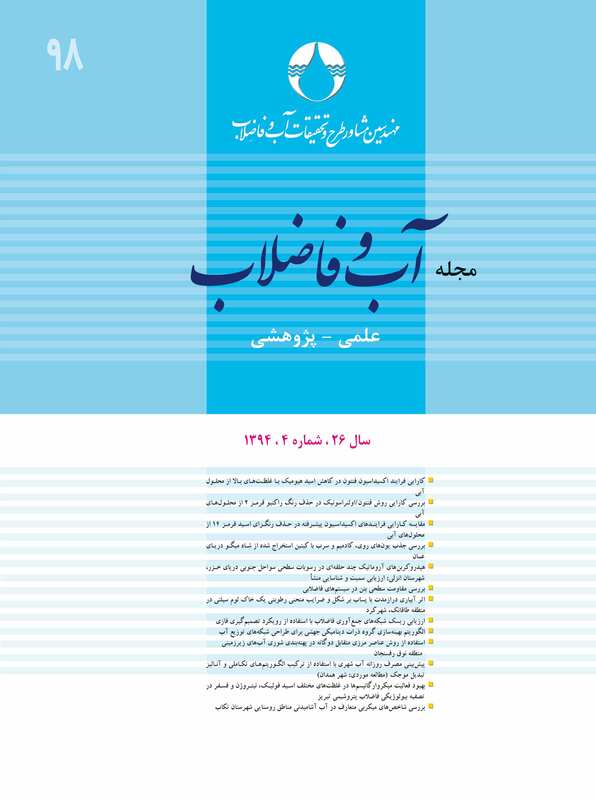 در سال‌های اخیر، سواحل دریای خزر متحمل فشارهای شدید انسانی به‌ویژه به‌علت ورود آلاینده‌های نفتی ناشی از فعالیت‌های استخراجی و پالایش نفت و تخلیه فاضلاب‌های خانگی و صنعتی شده و دچار خسارات جدی شده است. هدف از این مطالعه، تعیین منشأ و سطوح یکی از خطرناک‌ترین آلاینده‌های نفتی، یعنی هیدروکربن‌های آروماتیک چند حلقه‌ای در سواحل جنوبی دریای خزر (شهرستان انزلی) و مقایسه آن با استاندارد‌های موجود، به‌منظور کسب اطلاعات پایه برای اتخاذ فعالیت مدیریتی صحیح بود. به این منظور نه نمونه رسوب سطحی از این ناحیه برای آنالیز این آلاینده‌ها با استفاده از کروماتوگرافی گازی با طیف‌سنج جرمی جمع‌آوری شد. غلظت‌های مجموع PAHs در گستره 736 تا9009 نانوگرم بر گرم وزن خشک، همراه با تمایل افزاینده‌ای به‌سمت غرب تعیین شد. همچنین منشأ این ترکیبات با به‌کار‌گیری شاخص‌های متعدد، پتروژنیک تشخیص داده شد. در مقایسه با راهبرد‌های کیفی رسوب فلوریدا، TELs/PELs، سطوح نیمی از ترکیبات PAHs متجاوز از TELs و غلظت ترکیبات نفتالن، فلورن و فنانترن در برخی ایستگاه‌ها متجاوز از PELs به‌دست آمد که احتمالاً منجر به آثار سمی حاد خواهند شد؛ اما در مقایسه با راهبرد‌های ایالات متحده ERLs/ERMs، اغلب ترکیبات در اکثریت ایستگاه‌ها، سطوح کمتر از ERLs را نشان دادند. در نتیجه به‌کار‌گیری راهبرد‌های کیفی ایالت فلوریدا روش محافظه‌کارانه‌تری برای حمایت از موجودات زنده ساکن رسوب است. The Caspian Sea has recently experienced great damages due to intense pressure from human activities, petroleum contaminant discharges from oil extraction and refining activities, and domestic and industrial wastewaters discharged into the environment. The aim of this study was to determine the sources and levels of one of the most dangerous oil pollutants ‒ polycyclic aromatic hydrocarbons ‒ in the southern shores of the Caspian Sea (Anzali City). The data would be compared with standard PAHs concentrations in order to derive the information required for designing appropriate management measures. For the purposes of this study, nine surface sediment samples were collected from the experimental field and gas chromatography with mass spectrometry (GC-MS) was used to analyze the samples for their contaminants. The total PAHs concentrations ranged from 736 to 9009 ng g-1d.w with an increasing trend along the east-west direction. Also, multiple indexes were used to detect the petrogenic origin of these compounds. Compared with sediment quality guidelines (SQGs) of Florida (TELs/PELs), the levels for half the PAH compounds exceeded TELs. Moreover, naphthalene, fluorine, and phenanthrene concentrations exceeded the PELs in some stations, indicating likely acute toxic effects. However, comparison with sediment quality guidelines (SQGs) of the United States (TELs/PELs) revealed that most of the compounds at the stations investigated were lower than ERLs. It was concluded that the quality guidelines of the Florida State are more conservative for protecting the biotic organisms in the region. Guo, W., He, M., Yang, Z., Lin, C., and Quan, X. (2011). “Aliphatic and polycyclic aromatic hydrocarbons in the Xihe River, an urban river in China's Shenyang City: Distribution and risk assessment.” J. of Hazardous Materials, 186(2/3), 1193-1199. Bícego, M.C., Taniguchi, S., Yogui, G.T., Montone, R.C., da Silva, D.A.M., Lourenco, R.A., de Castro Martins, C., Sasaki, S.T., Pellizari, V.H., and Webe, R.R. (2006). “Assessment of contamination by polychlorinated biphenyls and aliphatic and aromatic hydrocarbons in sediments of the Santos and Sao Vicente Estuary System, Sao Paulo, Brazil.” J. of Marine Pollution Bulletin, 52(12), 1804-1816. Trabelsi, S., and Driss, M.R. (2005). “Polycyclic aromatic hydrocarbons in superficial coastal sediments from Bizerte Lagoon, Tunisia.” J. of Marine Pollution Bulletin, 50(3), 344-348. Ibbotson, J., and Ibhadon, A.O. (2010). “Origin and analysis of aliphatic and cyclic hydrocarbons in northeast United Kingdom coastal marine sediments.” J. of Marine Pollution Bulletin, 60(7), 1136-1141. Commendatore, M.G., Nievas, M.L., Amin, O., and Esteves, J.L. (2011). “Sources and distribution of aliphatic and polyaromatic hydrocarbons in coastal sediments from the Ushuaia Bay (Tierra del Fuego, Patagonia, Argentina).” J. of Marine Environmental Research, 74(0), 20-31. Shutaee Juybari, Sh., and Malek, J. (2005). “Investigation of the natural land scape and land use changes of the southern coasts of the Caspian Sea. using aerial photographs and GIS (Case study: Coastal city of Noor).” J. of Geographical Research, 37(51), 95-105. Shahrban, M., and Etemad Shahidi, A. (2009). “Determination of water quality of the Caspian Sea southern coasts using OECD and TRIX indexes.” J. of Environmental Sciences and Technology, 11(3), 193-204. Tolosa, I., De Mora, S., Sheikholeslami, M.R., Villeneuve, J.P., Bartocci, J., and Cattini, C. (2004). “Aliphatic and aromatic hydrocarbons in coastal Caspian Sea sediments.” J. of Marine Pollution Bulletin, 48(1/2), 44-60. 11. Parizanganeh, A., and Chris Lakhan, V. (2007). “A Survey of heavy metal concentrations in the surface sediments the Iranian coast of the Caspian Sea.” J. of Water and Wastewater, 63, 2-12. 15. 15- Zakaria, P.M., Okuda, T., and Takada, H. (2001). “Polycyclic aromatic hydrocarbon (PAHs) and hopanes in stranded tar-balls on the coasts of Peninsular Malaysia: Applications of biomarkers for identifying sources of oil pollution.” J. of Marine Pollution Bulletin, 42(12), 1357-1366. 16. Riyahi Bakhtiari, A., Zakaria, M.P., Yaziz M.I., Lajis, M.N.H., Bi, X., and Rahim, M.C.A. (2009). “Vertical distribution and source identification of polycyclic aromatic hydrocarbons in anoxic sediment cores of Chini Lake, Malaysia: Perylene as indicator of land plant-derived hydrocarbons.” J. of Applied Geochemistry, 24(9), 1777-1787. 17. Riyahi Bakhtiyari, A., Zakaria, M.P., Yaziz, M.I., Lajis, M.N.H., and Bi, X. (2011). “Variations and origins of aliphatic hydrocarbons in sediment cores from Chini Lake in Peninsular Malaysia.” J. of Environmental Forensics. 12(1), 79-91. 18. Dean, W.E. (1974). “Determination of carbonate and organic matter in calcareous sediments and sedimentary rocks by loss on ignition: Comparison with other methods.” J. of Sedimentary Research, 44(1), 242-248. 19. Veres, D.S. (2002). “A comparative study between loss on ignition and total carbon analysis on mineralogenic sediments.” J. of Studia Universitatis Babe-Bolyal, Geologia, 47(1), 171-182. 20. Santisteban, J.I., Mediavilla, R., Lopez-Pamo, E., Dabrio, C.J., Zapata, M.B.R., Garcia, M.J.G., Castano, S., and Martínez-Alfaro, P.E. (2004). “Loss on ignition: A qualitative or quantitative method for organic matter and carbonate mineral content in sediments.” J. of Paleolimnology, 32(3), 287-299. 21. Tam, N.F.Y., Ke, L., Wang, X.H., and Wong, Y.S. (2001). “Contamination of polycyclic aromatic hydrocarbons in surface sediments of mangrove swamps.” J. of Environmental Pollution, 114(2), 255-263. 22. Soclo, H.H., Garrigues, P.H., and Ewald, M. (2000). “Origin of polycyclic aromatic hydrocarbons (PAHs) in coastal marine sediments: case studies in Cotonou (Benin) and Aquitaine (France) areas.” J. of Marine Pollution Bulletin, 40(5), 387-396. 23. Gogou, A.I., Apostolaki, M., and Stephanou, E.G. (1998). “Determination of organic molecular markers in marine aerosols and sediments: one-step flash chromatography compound class fractionation and capillary gas chromatographic analysis.” J. of Chromatography A, 799(1), 215-231. 24. Lü, X., and Zhai, S. (2005). “Sources and transport of hydrocarbons in sediments from the Changjiang river Estuary, China.” J. of Marine Pollution Bulletin, 50(12), 1738-1744. 25. Boitsov, S., Jensen, H.K.B., and Klungsøyr, J. (2009). “Natural background and anthropogenic inputs of polycyclic aromatic hydrocarbons (PAH) in sediments of south-western Barents Sea.” J. of Marine Environmental Research, 68(5), 236-245. 26. Leite, N.F., Peralta Zamora, P., and Grassi, M.T. (2011). “Distribution and origin of polycyclic aromatic hydrocarbons in surface sediments from an urban river basin at the Metropolitan Region of Curitiba, Brazil.” J. of Environmental Sciences, 23(6), 904-911. 27. Wu, Y., Zhang, J., Mi, T.Z., and Li, B. (2001). “Occurrence of n-alkanes and polycyclic aromatic hydrocarbons in the core sediments of the Yellow Sea.” J. of Marine Chemistry, 76(1), 1-15. 28. Hu, G., Luo, X., Li, F., Dai, J., Guo, J., Chen, S., Hong, C., Mai, B., and Xu, M. (2010). “Organochlorine compounds and polycyclic aromatic hydrocarbons in surface sediment from Baiyangdian Lake, North China: Concentrations, sources profiles and potential risk.” J. of Environmental Sciences, 22(2), 176-183. 29. Burton, J.G.A. (2002). “Sediment quality criteria in use around the world.” J. of Limnology, 3(2), 65-76. 30. MacDonald, D.D. (1994). Approach to the assessment of sediment quality in Florida coastal waters. colume1-development and evaluation of the sediment quality assessment guidelines, Report Prepared for Florida Department of Environmental Protection, Tallahassee, FL. J. of Environment International, 32(4), 455-465. 32. Long, E.R., and Morgan, L.G. (1990). “The potential for biological effects of sediment-sorbed contaminants tested in the National Status an Trends Program.” NOAA Technical Memorandum NOS OMA 52, National Oceanic and Atmospheric Administration, Seattle, Washington, 175 pp 1 Appendices. 33. Long, E.R., Macdonald, D.D., Smith, S.L., and Calder, F.D. (1995). “Incidence of adverse biological effects within ranges of chemical concentrations in marine and estuarine sediments.” J. of Environmental Management, 19(1), 81-97.